Apparently on Friday the Coal Regeneration Trust officially opened their new shop next to Dransfields. The opening was held at Chesneys? M.P. Tricket attended the meeting and was surprised to see no one there. PERHAPS BECAUSE NO ONE WAS INVITED? WERE YOU? So what? Tricket if you remember made the front page last summer saying what he was doing for Featherstone. The story was not a story but a political press release. News papers will not let you reply to a press release they say, only a story. Story! Sounds like Jackanory to me. WHY? Tricket thinks he is responsible for bringing The Coal Regeneration Trust to Featherstone, and looks like milking it all he can. The fact is that the Coal Regeneration Trust has spent most of its money in the first 3 months of 3 years. Where has it gone? Well yet again yetion 1 has hit the nail on the head, and just proves that the use of his rear orrifice is used to talk and communicate rather engaging a brain cell (less effort possibly). Get your facts right boyo! Here we go again. Why not enter in to discusion before starting with Another Featherstone labour party halfwit comment. Which fact shall i post first? "YOU DECIDE" in the time it takes you to engage your brain to remove your head from rear orrifice. Better still we could be adults and have a conversation. Thats all it takes. As you are not in possession of any of the facts, it most unlikely that I could choke on your perception of what you think happened or you think is going on! As for your personal comment about my political bias, I have no leaning to any party and therefore do not wish to be aligned to any political alliance, thank you. At this juncture I really don’t think it’s for me to decide (see you found the caps lock! Nice touch). You maintain that you know, then you tell us, and I will be more than happy to correct any information that is not factual or just fabrication. Perhaps yetion1 ought to check his information sources. The Coalfields Regeneration Trust did have their official launch of the Family Employment Initiative on Friday 23rd January. It is not a shop but a free advice and support service for the people of Featherstone who are looking for work. Perhaps if yetion1 called in at the project office he could avail himself of the TRUE facts. Or if he doesn't have the bottle, he could check out the Coalfields Regeneration Trust website. The fact is, there are no facts in yetion1's original post on this subject. As this was a provable incorrectness appeals were made. Appeals were made as far as the M.P. Tricket. That’s the last time I spoke to, or met the M.P. A years work with a valid community project, 2 written applications, meetings, only to be told no for a made up reason. "Despite our best efforts a situation has arisen at CRT, please see below. It is a great disappointment to me that some projects are not going to have the capacity to progress as planned and I sympathise with the disappointment that you will no doubt be feeling, particularly as we have been in contact for over a year. I am writing to inform you that we are unable to progress your application at present. CRT has an allocation of funding which has a capital and a revenue element, currently we are vastly oversubscribed with requests for revenue funding and therefore we cannot make any further revenue awards at this time. CRT still has availability on our small grants Bridging the Gap Scheme for amounts of up to £10,000 (Please check your eligibility for our Bridging the Gap Scheme) or larger capital grants. I apologise for any inconvenience this may have caused you but we are experiencing a huge demand on our revenue resources." 1. The first 8 months brought missing letters and an application plus 3 different staff members the last that went sick. 2. Finally got a new CRT worker and together with CRT worked silently to inform them of what Featherstone needed in detail for them to arrive in 2008. This did not mean that an application form for 2008 money came first to me in the queue. I had to ask hard. 3. 2nd application handed in (all these documents are 100 pages +). Application forms are altered and must be re-filled in. 4. 3rd application handed in. application forms are altered a second time and must be altered and re-filled in. 5. 4th application is told before re-submitting that there is now no more money. As for the rest of your other comments I assumed you are labour after looking what you get up to in the world “Roy”. Would you like to alter your fabricated number of important people that attended. My my you have got a bee in your bonnet Mr Yetion1. However I do know that the Family Employment Initiative is a completely separate project to the CRT's grant awarding body. Here is something that is actually benefitting the people of the town and perhaps it might be better if you spat out your sour grapes, put your personal political views to one side and gave thanks for a project that helps local people. Oh and by the way, the launch event WAS attended by around 50 to 60 people - people who wish the FEI every success - people who want to help Featherstone and its residents. It’s great that a shop is at least not another take away (2 more arriving) and is a great asset to Featherstone. So it is a Job Centre, advice centre and support service, great. Isn’t that what I said? Why does the M.P. consider it is his doing? If it is has he spent the cash? Why not spend his funds instead of using our regeneration capital? My bottle! Isn’t that your main concern? Are you inviting me to the office and offering a name I should talk to that will offer any more information gained of CRT in the last 4 years than I all ready know? I believe that the name 'Roy' has royal connections and therefore the colour is more likely to be blue than red! It would appear that you have more time than I to 'make your point' despite the content not always being factually correct. I think the important thing from this being highlighted is that the people who are really important know the truth. Everyone in the town is important, everyone should know the truth not just those you say are "really important". The people of this town deserve the respect of people in positions of office who should tell us the truth. The people who are affected by proposals and decisions should know about them. You sign off with Goodbye, does that mean you are no longer going to post? Such a shame. Perhaps you are a really important person and know the truth. Do you not wish to tell us, the ordinary people the truth, let us know what secret plans and schemes exsist behind closed doors. I somehow doubt it, when challenged on this forum the majority leave after first telling us all that they know the truth and the content on here is not factual. Thats fine but none off those people have ever offered alternative "truth", you included. This is a bloody outrage. The Yorkshire public should be complaining in their thousands. The final result of C.R.T. 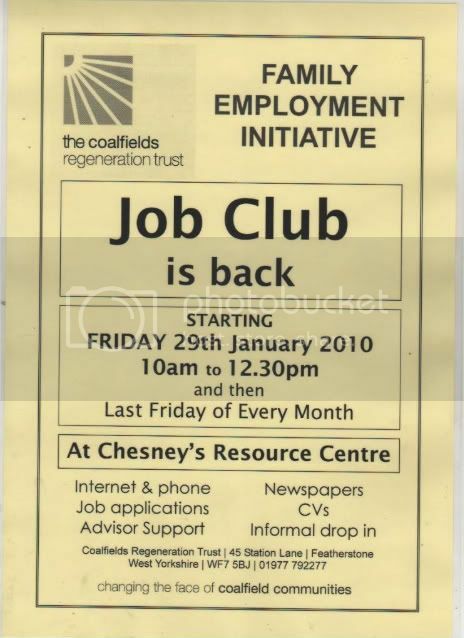 (the coal regeneration trust) was as predicted, bent. Jobs or wages for the boys? Oh yes, and remember the CRT man from station lane mouthing off. What you got to say now? After personally been given the run around early on it was clear to see something was afoot. Even Featherstone Rovers have been given the same run around. Why have they all not been sacked and shut down to salvage what little is left? Hi, CRT would like to invite you to a FREE event at the Keepmoat Stadium in Doncaster. All you need is groups of 4 boys and/or girls or multiples of four boys/girls and you can take part in Quadkids. QuadKids is a new and exciting sporting concept designed to give more children the opportunity to enjoy the benefits of athletics and also to help identify the stars of tomorrow. QuadKids team based competition is where each child does four events (sprint, run, long jump and a throw) specifically designed to be inclusive, competitive, quick, fun and simple to do. YOU DON’T HAVE TO HAVE HAD ANY EXPERIENCE AT ATHLETICS, IT’S ALL ABOUT HAVING FUN AND HAVING A GO AND GETTING A MEDAL. If your group is interested in attending or if you would like more information please contact Jill North on 07989355905. There is FREE TRANSPORT from certain pick up areas throughout the region.